Dr. Stephen P. Oliver, referred to affectionately as 'SPO,' began working at the University of Tennessee in 1984 as an assistant professor in the Department of Animal Science. He served as professor in the Department of Animal Science for twenty-six years. During this time, he established a nationally and internationally recognized research program on milk quality and dairy food safety. 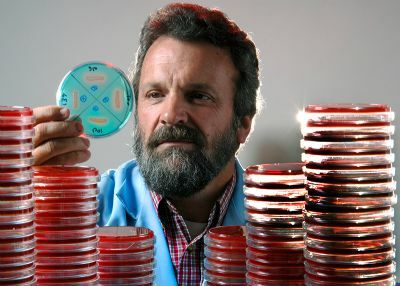 Among his awards and recognitions, Dr. Oliver received the 2009 Chancellor's Award for Research and Creative Achievement, the 2004 Gamma Sigma Delta Faculty Team Research Award of Merit as a member of the Cloning Research Team, and the 2001 University of Tennessee/Oak Ridge National Laboratory Science Alliance Research Award. In 2010, Dr. Oliver began serving as Assistant Dean of AgResearch. In this role, he focuses on UT AgResearch programs by facilitating the development of multidisciplinary faculty teams that united departments and institutions. He also promotes AgResearch relationships with commodity groups, agencies, and professional groups. Dr. Oliver will retire this summer with plans to serve in a post-retirement role to provide guidance to the new Assistant Dean of AgResearch. In his retirement, he plans to spend time with family, including his wife, two sons, daughter, and three Labrador retrievers. He will split his time between a beach condo in Florida and lakefront home in Maryville. Dr. Oliver, we wish you all the luck in the world! My first contact with Steve occurred while I was head of the Animal Science department and he replied to a position announcement. Steve was very impressive during his interview and left a clear impression that he was going to leave some big footprints somewhere. My attitude was why not at Tennessee? We were striving to add individuals with recognized grant achievement potential and Steve was a great fit for our long-range goals, and his area of expertise (mastitis) was a real-life problem in Tennessee dairy herds. Thus, his program had the potential to significantly impact Tennessee's agricultural income. The quality of faculty at an institution reflects on the administrator's abilities, and I always wished that every hire was a person like Steve Oliver—capable and driven to succeed. I remember Steve for his ability to get major grants for his research in mastitis. He was also helpful to me in assisting dairy farmers with problems in mastitis detection and treatment. He and his group guided our educational programs in mastitis control. I hope he has planned activities for retirement so that he can stay busy. Good luck in the future. When I first met Dr. Steve Oliver, there was an immediate bond because of our shared interest in serving and improving the dairy industry of Tennessee and ultimately the nation. Little did I know that he was going to be a hands-on researcher. A work plan was not just a document to him. Dr. Steve was always there to make sure the plan had an excellent chance for success. I must admit that when he proposed the idea to investigate udder health in pre-calving heifers, I questioned in my mind what could come of such an effort. The first time I crawled around under heifers that were not happy to have samples of their udder secretions taken made me think that Dr. Steve was punishing me. That piece of research may have helped more dairy farmers than we will ever know. Thank you, Dr. Steve, for all your hard work and the special way that you allowed everyone at the Dairy AgResearch and Education Center to feel like they were part of your team. Even “L 125” felt like she was on your team even though she hated you. The dairy industry has greatly benefitted from your insight and dedication. Dr. Oliver… the stories that could be told. Both inspirational and funny. Inspirational: As my MENTOR, SPO simply said, “Become financially independent of the department’s budget so when times are rough, your program continues to grow!” I followed his advice to the best of my ability. Inspirational: TEAM… Watching Dr. Oliver interact with his team was the foundation for the teamwork in my labs. SPO was very protective of his team, which included technicians, post docs, and a few graduate and undergraduate students. Team members would have lab meetings frequently to discuss issues or scheduling, as well as the research they were performing. He is and was all about TEAM and never worried about the “I.” If the team was successful, then he would be successful as would the department! Inspirational and funny: SIZE. I knew that if my mentor could be as successful as he was at his size, being a half inch taller should mean that I was due for great success, even without the numerous red sports cars!!! I met Steve Oliver in the spring of 1991. When I arrived at his office, I found a small guy with big hair and a big beard. As soon I introduced myself, he leaned back, put his feet on the desk, and asked, “What do you know about mastitis?” After several more questions, we sealed the deal, and I became a postdoc of the Steve Oliver Mastitis Research Group, in which I’ve spent twenty-five years (and counting) of my life. From the first day until now, Steve was a very energetic, never-stopping, pushing, and controlling (in the good way) working machine. Together we developed high impact research on Streptococcus uberis mastitis, and we presented data all over the world. We were together from taking samples in the morning milking in DREC in Lewisburg, to singing karaoke in a bar in Seoul; from the Streeza-Milan train to visiting farms in the las Colonias County in the Province of Santa Fe, Argentina. Yes, I can say that we shared a lot of time together, and still I cannot understand how a person with such a small body can snore so loudly….to the point of awakening people in other rooms. Steve, who is a hard rock drummer and fan of Ronnie James Dio, is also a very inspiring person with a brilliant mind and heart of gold. I learned a lot with him, he was a wonderful guide in my career as a researcher, but most importantly he is a very trustful friend. I hope and wish that he enjoys life and family in the next years. I met Dr. Oliver when I came to the University of Tennessee as a doe-eyed, shy, very smalltown girl with aspirations of being a veterinarian, like every other person who enters the Animal Science program. Shy is not a quality that lasts long around Dr Oliver. We often joke that the only reason he hired me was because I was shorter than him. I have learned many things while under the expert tutelage of Dr. Oliver. He showed me that being a veterinarian was an honorable profession, but there were other issues in the animal world that needed to be addressed, as well. The greatest lessons he has taught me were one should always have a great work ethic and to never give up. He started the day early and worked continuously and tirelessly until finished. He expected the same from all individuals in his group. You could always tell he was in the building by the music drifting down the hallway. Trust me, you do not want to get in a music trivia contest with this man. He knows his music! He has put up with my love of country music through the years, but when he gains control of the radio on a road trip, the windows are thumping. Through all the years our group has felt more like a big family. I treasure each project, every late night, early morning, manure-splattered coverall, event that has happened in the many years we have been together. He has had an incredible influence on my life and has witnessed most of the major events in my life, from graduating UT to the birth of my beautiful son. People have come and gone through the years. He has been the one constant. Now the time has come to pass the torch and enjoy something called downtime. I understand his lovely wife probably had to look that definition up and explain it to him. Good or bad, that is another quality I feel I have learned from him, as well. Try to kick back, enjoy the warmer weather instead of collecting samples in freezing temps, throw the ball a few more times for the pups, go for a long drive to no particular destination, just be happy. Know that your presence will be greatly missed, but your teachings will live on for many years to come. I began what I considered my dream job on October 1, 1998. Although my department head told me that I would be appointed a faculty mentor at some point in the “near” future, I was quick to state that Dr. Steve Oliver, official or otherwise, would be serving in that role. Let’s face it, anyone who can help tame/temper the “Okie” in Neal Schrick has to be a great mentor. Having just declared him as my mentor, a face-to-face meeting then became appropriate to convince him that I would be a great use of his mentoring time. While I would like to think that his decision to say yes was because I totally wowed him during our first meeting, the reality was likely something much different given that some of my first “take home” messages in the words of my great mentor included “you must start saying NO” and “choose your battles wisely.” This sage and much needed advice fit well with what others had told me previously about Dr. Oliver’s straightforth, no fluff way of telling mentees what they “needed to hear.” To this end, Dr. Oliver has never disappointed or fallen short of the expected mark. There is no doubt that academic life is both rewarding and challenging. We all celebrate the grants and patents awarded and papers published. After sufficient time passes and if you are one of Dr. Oliver’s mentees, you may even find the time to “celebrate” being a member of the Loser Club of “rejected” proposals to the American Jersey Cattle Club. Dr. Oliver was quick to remind me and others that one thing in research is for certain: if you don’t submit a grant, you won’t get one. Aside from obtaining grants, the challenging aspects of our job are not always entirely expected, especially when efforts at work and home collide in an attempt to strive for work-life balance. While I continue to struggle in this area, Dr. Oliver from the onset of my career provided a great role model by always seemingly emphasizing that work-life success is highly dependent on family-life success. Don’t forget to send us some of your laughter and joy along the way.